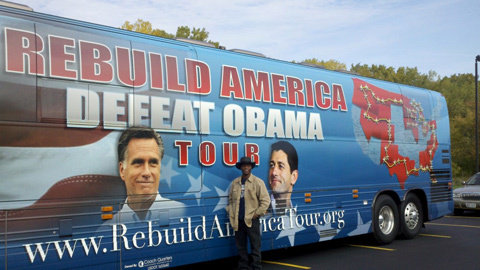 When our Rebuild America Defeat Obama tour bus rolled into downtown Dayton Ohio, the hostile vibe from blacks on the streets filled the air. A young black man called our team, Romney and Ryan "M-F-ers" before walking away. I went to find a restroom and passed a group of young blacks on a street corner murmuring about our tour buses. A young black staffer on our team said he thought he was going to have to break out his Chuck Norris skills. Clearly, our team was at risk. I am grateful to report that the Lord had our backs and nothing serious happened. However, I could not help thinking, "This extreme racial tension and polarization is the fault of the irresponsible Chicago thug in the White House." One could argue that it would be the same if any other black were president. I think not. A responsible black president would discourage his supporters from using race to further his agenda and win reelection. A president worthy of the office would understand that national racial unity is fragile and precious; not something to be exploited to win policy issues or sacrificed on the reelection alter. But only a person of character would think such high thoughts. A minister said there is nothing worse than a small person in a big position. Obama has proven himself to be a "small" man, lacking in character. Not only is Obama incapable of taking the higher ground to discourage racial cliches, he stirs the pot of racial stereotypes and false assumptions. Heck, Obama's minions have made "race" the centerpiece of his reelection campaign. Their message is simple. Anyone not voting for Obama is a "hater" and a "racist." Dear Lord, how did we as a nation come to expect so little in terms of the morality and character of our leaders? Obama runs America like a mob boss with young zombie blacks, his bully Justice Department and SEIU/ACORN thugs as his enforcers. 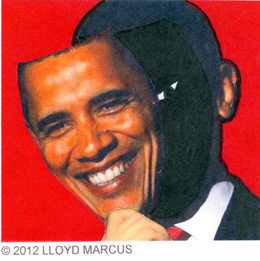 In response to the Trayvon Martin shooting, Obama said if he had a son, he would look like Trayvon. http://www.youtube.com/watch?v=_KQc_L0MCds Why is that relevant other than to interject race? Obama launched a campaign ad titled, African-Americans for Obama. http://www.youtube.com/watch?v=BdjoHA5ocwU When is the Caucasian-Americans for Romney ad coming? The mainstream media would have a cow. A video resurfaced showing Obama basically telling blacks that the government does not like them. Thus, concluding that racism made aid to post-Katina New Orleans slow. http://www.youtube.com/watch?v=N-yQAGKaTqs This is the man in our White House folks. Had blacks such as JC Watts or Condoleezza Rice been elected president, I do not believe that we would see a racial line dividing the heart of America. Brother and sister Americans, we deserve much, much better than Barack Hussein Obama.